Do you love linzer cookies and hate the rolling cutting and forming? These will make you really glad you found the recipe! 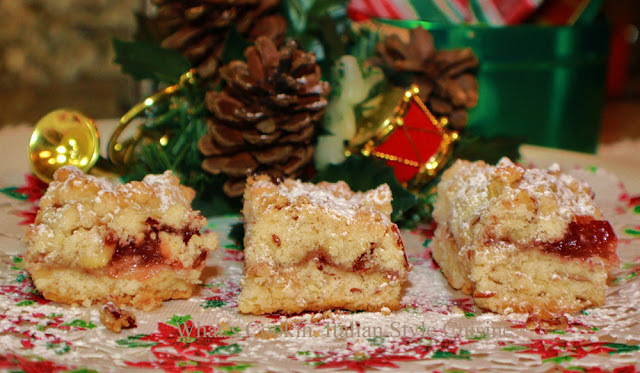 These amazing bars have all the taste of the linzer cookies all in one pan! Nope they don''t look as pretty but everyone is going to want the recipe. I can''t tell you how many times someone asks for this one after they taste these! They smell great cooking too. What can be easier? In a large bowl using an electric mixer, cream butter, sugar till light and fluffy. Beat in egg, lemon peel. Stir in the flour, and ground nuts. 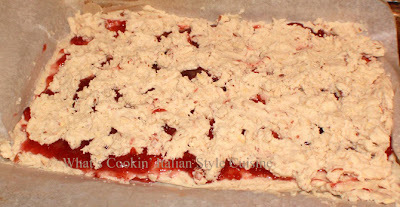 Spread 2 cups of dough onto a parchment lined 13x9 pan. Spread with the raspberry preserves. Crumble the remaining dough on top. Bake at 350 degrees in a preheated oven until lightly browned around 40 minutes. Cool completely. Cut into bars. Sprinkle with confectionery sugar. Doesn't matter how they look in my belly,,,but they're adorable! These bars sound yummy. I'd rather have good tasting bars than pretty cookies. A great idea, Claudia. 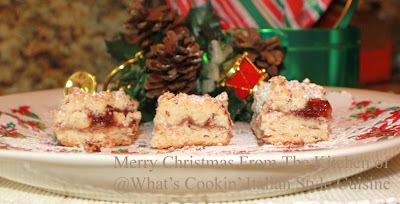 I make mini linzers with pink frosting, but they are labor intensive. May just add my pink frosting to these! Have a Merry Christmas Claudia.